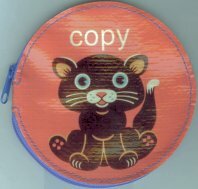 This little change purse features a little kitten called Copy. The design is repeated on the reverse side. The vinyl change purse is 4 3/4" in diameter. Zippered closure top. New, purchased at a manufacturer's sample sale of discontinued items.